In 1935, Reza Shah Pahlavi changed the name of Persia to Iran, basing the new name on an ancient one, Eran. Eran was the name applied by ancient kings of the Persian Empire to cover the people over whom they ruled. These were the "Aryans", a linguistic group that encompassed a large number of sedentary and nomadic people of Central Asia. At its height, in about 500 BC, the Achaemenids (the founding dynasty of the Persian Empire) had conquered Asia as far as the Indus River, Greece, and North Africa including what is now Egypt and Libya. It also included modern-day Iraq (ancient Mesopotamia), Afghanistan, probably modern-day Yemen, and Asia Minor. The beginning of the Persian empire is set at different times by different scholars, but the real force behind the expansion was Cyrus II, aka Cyrus the Great, in the mid-sixth century BC. Until the time of Alexander the Great, it was the largest empire in history. Cyrus belonged to the Achaemenid dynasty. His first capital was at Hamadan (Ecbatana) and then Pasargadae. This dynasty created the royal road from Susa to Sardis that later helped the Parthians establish the Silk Road, and a postal system. Cambyses and then Darius I the Great expanded the empire. Artaxerxes II, who reigned for 45 years, built monuments and shrines. Even though Darius and Xerxes lost the Greco-Persian wars, later rulers continued to interfere in Greek affairs. Then, in 330 BC, Macedonian Greeks led by Alexander the Great overthrew the final Achaemenid king, Darius III. Alexander's successors established what was called the Seleucid Empire, which was named for one of Alexander's generals. Persians regained control under the Parthians, although they were still heavily influenced by the Greeks. The Parthian Empire was ruled by the Arsacids, named for Arsaces I, leader of the Parni (an east Iranian tribe) who took control of the former Persian satrapy of Parthia. In 224, Ardashir I, the first king of the final pre-Islamic Persian dynasty, the city-building Sassanids or Sassanians defeated the last king of the Arsacid dynasty, Artabanus V, in battle. Ardashir came from the (southwestern) Fars province, near Persepolis. The empire founding king Cyrus the Great was buried at Pasargadae. 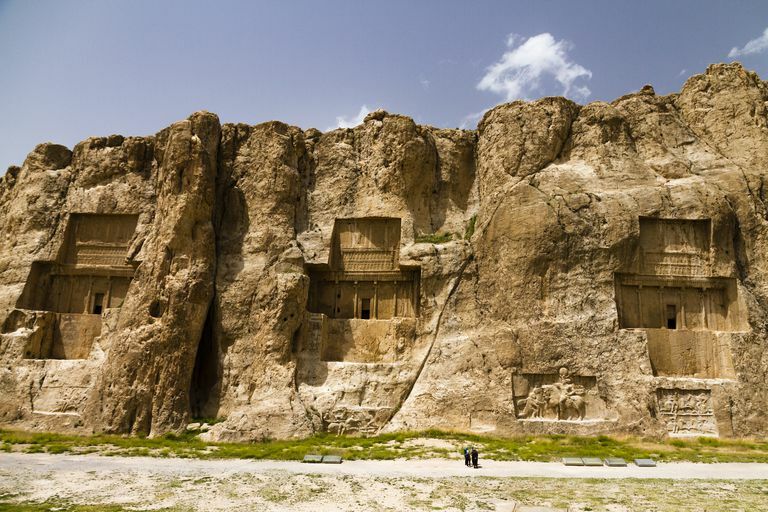 Naqsh-e Rustam (Naqs-e Rostam) is the site of four royal tombs, one of which is that of Darius the Great. The other three are thought to be other Achaemenids. Naqsh-e Rustam is a cliff face, in Fars, about 6 km northwest of Persepolis. It contains inscriptions and remains from the Persian Empires. From the Achaemenids, in addition to the tombs, is a tower (Ka?ba-ye Zardost (cube of Zoroaster) and. Inscribed on the tower are the deeds of the Sassanian king Shapur. The Sassanians added towers and Zoroastrian fire altars to the cliff. There is some evidence that the earliest Achaemenid kings may have been Zoroastrian, but it is disputed. The famous Cyrus the Great is known for his religious tolerance vis a vis the Jews of the Babylonian Exile and the Cyrus Cylinder. Most of the Sassanians espoused the Zoroastrian religion, with varying levels of tolerance for non-believers. This was at the same time that Christianity was gaining momentum. Religion wasn't the only source of conflict between the Persian Empire and the increasingly Christian Roman Empire. Trade was another. Syria and other contested provinces led to frequent, debilitating border disputes. Such efforts drained the Sassanians (as well as the Romans) and the spread of their military to cover the four sections (spahbeds) of the empire (Khurasan, Khurbarãn, Nimroz, and Azerbaijan), each with its own general, meant that troops were too thinly spread to resist the Arabs. The Sassanids were defeated by Arab caliphs in the mid-7th century AD, and by 651, the Persian empire was ended. Curtis, John E. and Nigel Tallis. 2005. Forgotten Empire: The world of ancient Persia. University of California Press: Berkeley. Ghodrat-Dizaji, Mehrdad, "Durb Dag N During the Late Sasanian Period: A Study in Administrative Geography," Iran, Vol. 48 (2010), pp. 69-80. How Did the Persian Empire Last So Long? What Was the Purpose of the Behistun Inscription, and Who Made it? What Major Thoroughfare Did Darius the Great Use to Conquer the World? What Were the Reasons Alexander Burned Persepolis?